This children's song has been changed slightly by the Speks to dramatise what happens to Incy Wincy spider. The flute descends the scale on "down came the rain and it washed the spider out" to represent Incy Wincy falling down the water spout. Harmony vocals are added to "out came the sun and it dried up all the rain" as a celebration of more sunshine. The flute ascends the scale as Incy "climbed up the spout again." The guitar is played in a gentle creepy crawly manner to mimic the spider's movements. We also transpose the Irish music (played with flute and accordion) to a higher key to symbolise the spider climbing up to a higher part of the water spout! Click on the play arrow above to listen to our version of Incy Wincy Spider set to Irish music for kids. Go to The Spider page where you can share our nursery rhyme with your friends and/or get it as a free MP3 download. Click on the arrow below to watch our youtube video clip of "Incy Wincy Spider"
Art: Make spiders with your class. Paint a paper plate black. While waiting for the paint to dry make eight legs out of strips of black paper folded like a concertina or accordion. Glue the legs (four opposite four) to the plate and paint yellow eyes. Young children love making these! Physical Education: Match the spider's movements. 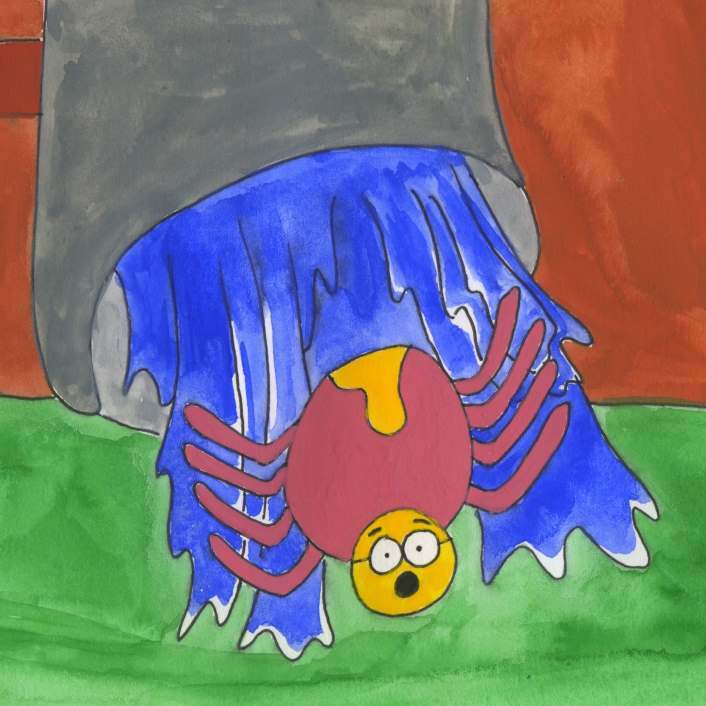 Creep around in time with music while singing "Incy Wincy spider climbed up the water spout." Stretch towards the ceiling, bringing arms down slowly and sit on your hunkers while singing "down came the rain and it washed the spider out." Jump up and extend arms to make the letter "Y" while singing "Out came the sun and it dried up all the rain." Finally, creep around while singing "and Incy Wincy spider climbed up the spout again." Social, Environmental and Scientific Education: Study spiders. For example, a spider is not an insect it is an arachnid; It has eight legs and two body parts; Most spiders make webs but some don't; Spiders are useful because they help keep fly and bug populations in check.